This is a port of C-Dogs SDL v0.04 (https://icculus.org/cdogs-sdl) for Dingoo A320. C-Dogs is a game for DOS. 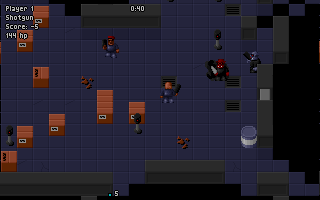 The player character(s) are elite soldiers, taking on mission after missionto defeat evil in any form. That is, you kill it or blow it up. Sounds violent? Yep, that's right. Still, the emphasis is on gameplay rather than gore. But the game will involve a lot of mowing down of enemies - and the occasional unlucky civilian - so now you have been warned. Button 1 is used to select menu items and to fire weapons in the game. Button 2 is sometimes used to cancel operations. In the game button 2 can be used to change weapons or, with directional controls, to slide. - The game is not at fullspeed yet.